This article is reposted from the UCL Museums blog. 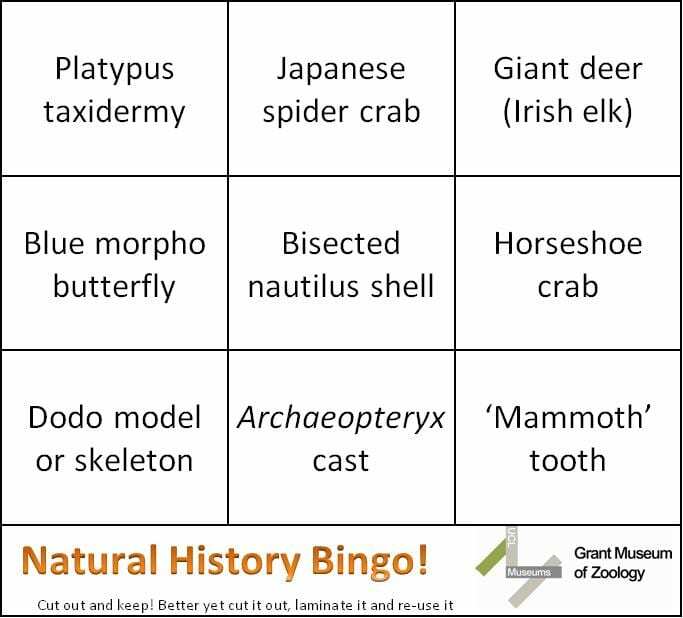 My colleague Jack Ashby alluded to the Natural History Bingo Card in a recent blog post so I thought I’d take the time to present it to the wide world! Natural history museums are funny places. Despite the millions of species of animals and the enormous variation within species between broods, sexes, life stage, populations and seasonal variations you’d expect that you could visit every natural history museum in the World (finances allowing) and never see the same thing twice. You might think that, but the truth is many natural history museums have the same stuff on display whether you’re at the Grant Museum, the Natural History Museum London or in Paris, New York, Prague or Plymouth. In fact, some specimens are so common, you can go around a natural history museum with this handy NATURAL HISTORY MUSEUM BINGO* and nine times out of ten you’ll have seen most of these specimens before you get to the gift shop. So what gives? Last week I saw something that had never occurred to me might be possible to see. Through the years I have learned a lot about this object – I knew where it was, I knew where it came from and I certainly know its place in the pantheon of the history of natural history. We even have a cast of it in the Grant Museum. If you had asked me what the best natural history object in the UK was, most days I would tell you it was this one. I had just assumed that seeing it wasn’t something that ever happened, even for people who run university zoology museums. 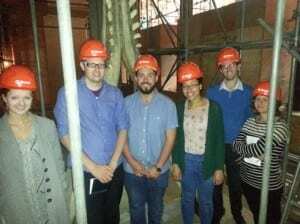 Last Wednesday the staff of the Grant Museum went on an expedition to the Oxford University Museum of Natural History (OUMNH), which is closed for roof repairs until 2014. On a visit to the zoology section a cupboard was opened before us, it was filled with skulls, dried fish and a couple of boxes. As the history of this cupboard was explained – it was Tradescant’s Museum – the oldest in the country – it suddenly dawned on me what was in those boxes. And that we were going to see it.